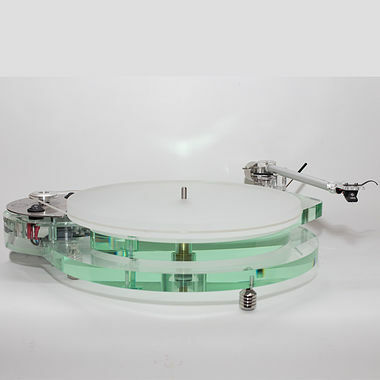 A stunning combination of style and technology the Roksan Radius 7 Turntable and Roksan NIMA Tonearm delivers the ultimate contemporary vinyl playing experience that takes aesthetic appeal, technical performance and musicality to a new level. See our package deals with cartridge. The Radius 7’s 20 mm thick acrylic plinths have a 'glass-like' look that is not only visually stunning but contributes towards excellent sonic performance. It uses an advanced motor/PCB assembly with electronic speed selection. The motor and PCB uses Roksan’s flagship technology. This very high-quality crystal speed control system maintains pitch-perfect speed stability for both 33 and 45 RPM irrespective of voltage variations. The Radius 7 can be purchased with or without the latest-generation hand built NIMA tonearm.